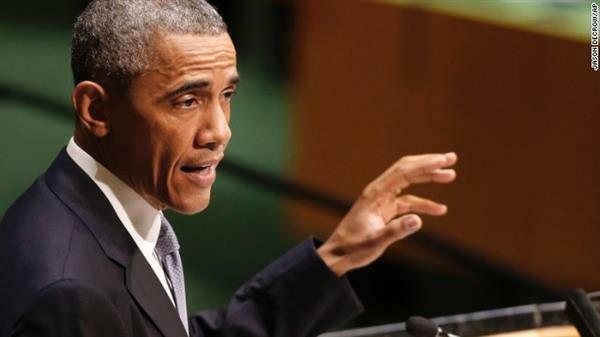 Obama talks ISIS at U.N.
President Obama addressed the United Nations on key global issues including the ISIS threat and Ebola. It was a "strong speech," says our colleague Wolf Blitzer. Follow this blog and Watch CNN on TV or online for more analysis. CNN's Amanpour to secretary of state: Is leader of Khorasan Group dead? U.S. Secretary of State John Kerry told CNN's Christiane Amanpour on Wednesday that he "can't personally confirm" whether the leader of terrorist organization Khorasan Group was killed in airstrikes. Overnight Tuesday into Wednesday, airstrikes were carried out against five more targets, four in Iraq and one in Syria, a U.S. official told CNN. There was one strike by a U.S. aircraft and another by a coalition plane on an ISIS staging area near the Iraqi border but inside Syria, northwest of Al Qa'im, damaging eight ISIS vehicles. The secretary of state confirmed there will "definitely" be a third day of strikes in Syria. "This is going to go on," he told CNN's Christiane Amanpour. Kerry said everyone is "fixated" on strikes but should keep in mind that strikes against ISIS and other terrorists are a "broad" and long-term effort. Conceding that U.S. airstrikes haven't flushed out ISIS in Iraq, Kerry said the strikes nonetheless have "stopped the onslaught" of violence in parts of the country. Airstrikes have been effective in halting ISIS' march toward Irbil and Baghdad and taking other important territory, he told Amanpour. ISIS militants "raised the threat level" to such a degree, the international community knows it must fight against them. "It's a fight that involves all of us," Kerry told Amanpour. The Islamist fighters' barbaric methods challenge basic human values and stability of states in the Middle East, Kerry said, and those who are working with the United States to degrade and defeat ISIS recognize the "fundamental evil" that ISIS fighters are committing. Battling ISIS in Iraq will take time, in part because the Iraqi military needs to be reconstituted, and because it will take time to arrange local support for battling the militants -- support similar to the Sunni Awakening during the Iraq war that mobilized years ago, Kerry said. U.S. airstrikes alone aren't designed to defeat ISIS , he said. "You and others should not be looking for some massive retreat in the next week or two," Kerry said. Josh Earnest told CNN "New Day" anchor Chris Cuomo that President Barack Obama's speech to the U.N. General Assembly on Wednesday morning will convey a "forward-looking, optimistic vision" concerning several global issues. Beyond ISIS, Obama will talk about a coalition to 'confront Iran" to bring the nation into compliance with international law governing nuclear weapons.